Tidy mounds of substantial blue-green foliage provide borders and containers with color and texture, performing well in shady spaces that are hard to fill. 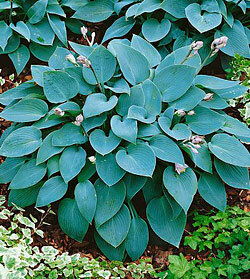 Hosta ‘Halcyon’ reaches just 2’ high and spreads up to 3’ wide, lush with distinctive heart-shaped leaves. Late in summer, strong stems rise above the foliage and carry fragrant, nodding flowers of pastel lilac and white that are irresistible to hummingbirds. Hostas provide unique garden interest, combining and contrasting beautifully with other shade-loving plants like ferns and astilbe. Slugs and snails are rarely a problem because of the thick leaves. Our premium divisions are guaranteed to flourish in your most difficult shade!